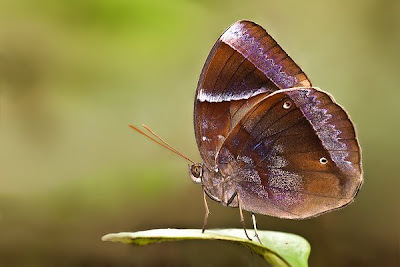 The Dark Blue Jungle Glory (Thaumantis klugius lucipor) belongs to the sub-family Morphinae of the family Nymphalidae (Brush-Footed Butterflies). It is a forest-dependent species which is rather rare. Although it is observed from time to time in the nature reserves, very little is known of its life history in Singapore, nor the host plant its caterpillars feed upon. Often, only individuals are observed, displaying its typical sulking behaviour, feeding on rotting fruit and other organic plant waste amongst the forest litter. 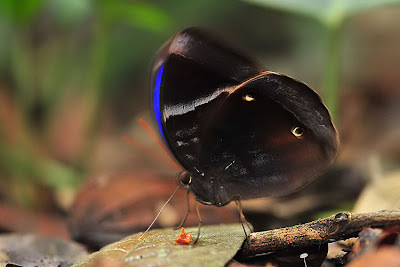 The Dark Blue Jungle Glory, which is the sole representative of the Thaumantis genus in Singapore, has its upper sides an iridescent deep ultramarine blue in colour. 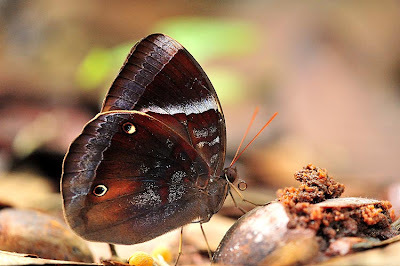 The beauty of this tropical butterfly is often compared to the Morphos butterflies of the Amazonian forests. 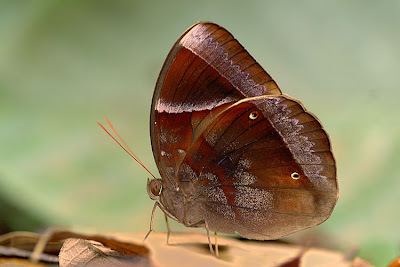 The undersides of this species bears crypic patterns of various shades of brown. 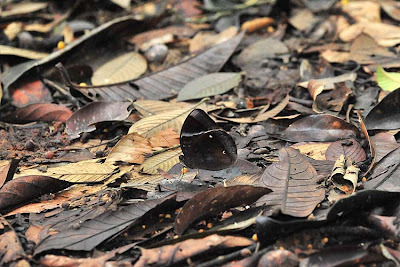 This camouflage renders the butterfly invisible when feeding on the forest floor amongst the dead leaves and other organic clutter. This explains why the butterfly is more often seen with a flash of deep blue as it makes its escape when disturbed. 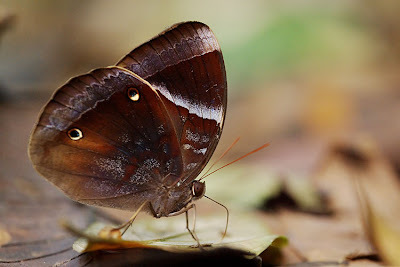 Most of the time, the butterfly has a sulking habit, preferring deep forested areas, and keeping close to the ground. It is usually seen early the morning or in the later hours of the day. Although it has been written that the species is generally not attracted to rotting fruit bait, it has been observed to feed on overripe fig fruits in the nature reserves in Singapore. It may well be that the Dark Blue Jungle Glory does not share the same preference to the rotting fruits that other species of the Morphinae are attracted to. The iridescent deep blue colour of the wings above extends from the base to the black submarginal border in the male and is much reduced in the female, where the blue is restricted to the outer half of the wings. 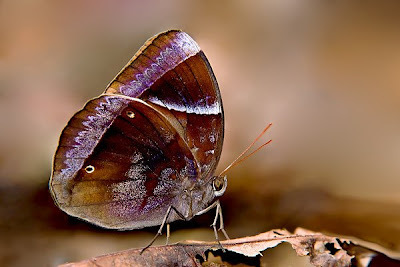 The butterfly is relatively large, and attains a wingspan of up to 100mm in the females.